3/6 Vicki Brichfield was interviewed about American politics in the Trump era on Belgian radio (in French). 3/7 Gen. Breedlove briefed faculty and staff on his recent trip to Croatia, Georgia and Ukraine with U.S. European Command Region Field Study. 2/21 Claire Greenstein and Elizabeth Osman’s article “Remembering Antisemitism When Public Memory is Fleeting,” published in New America Weekly. 2/20 Vicki Birchfield spoke at the Royal Academy of Belgium as part of a series on President Trump and the World. 2/7 Gen. Breedlove and Amb. Vershbow’s report for the Atlantic Council Permanent Deterrence: Enhancements to the US Military Presence in North Central Europe published. 2/6 British Consul General Andrew Staunton discussed Brexit and its implications for UK-US relations. 12/12 Austrian Ambassador to the US Wolfgang Waldner and a panel of experts discussed transatlantic trade relations. 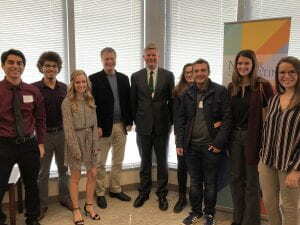 12/5 Georgia Tech students attended Global Atlanta’s “conversation” with Irish Consul General Shane Stephens. 11/16 Alasdair Young’s article “Where’s the demand? Explaining the EU’s surprisingly constructive response to adverse WTO rulings,” published on-line by the Journal of European Integration. 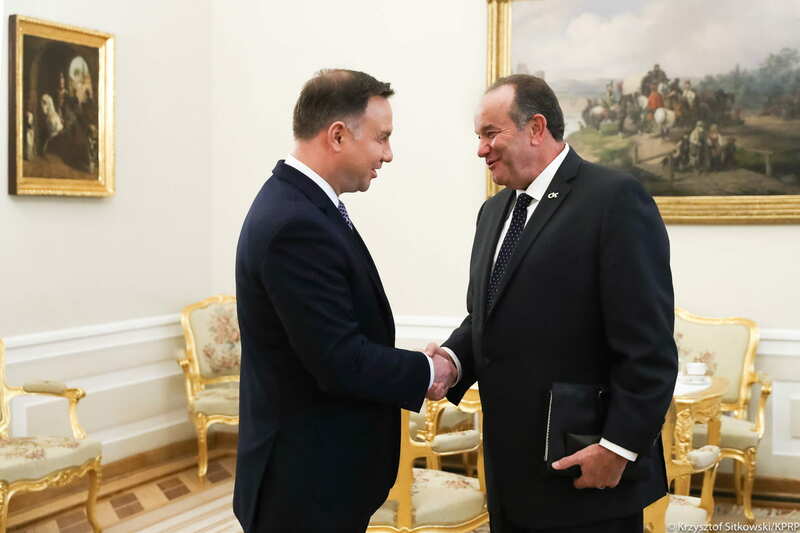 11/14 General Breedlove met with the Polish President, National Security Advisory and Minister of Foreign Affairs. 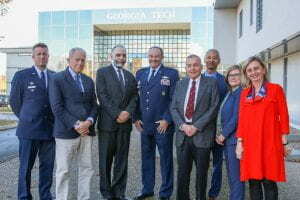 11/8-11 “1918 End of the Great War, Emergence of the US Role in the World, France and the Grand Est Region” an event commemorating the Centenary of the Great War and the Armistice took place at Georgia Tech Lorraine. 11/8 Claire Greenstein’s article exploring “How Far Has Germany Actually Moved to the Right?” published in New America. 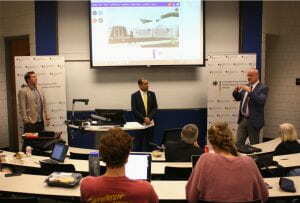 11/7 Robert Bell discussed “The Future of Nuclear Arms Control in the Age of Trump” at Georgia Tech Lorraine. 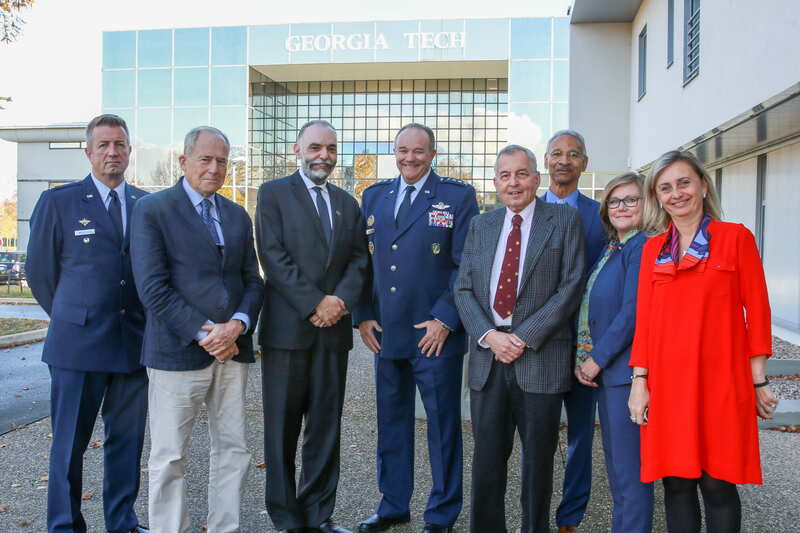 11/5 General Breedlove discussed “21st Century Warfare” at the Atlanta Council on International Relations. 11/1 Vicki Birchfield was made a visiting scholar at the University of Luxembourg’s Institute of Political Science. 10/30 Claire Greenstein presented her paper “Pressures and Payments: Explaining West Germany’s Domestic Holocaust Reparations Program” at Georgia State. 10/29 Vicki Birchfield gave an invited lecture on “Regionalism and Economic Integration in the 21st Century: Lessons from the European Union” at the University of Luxembourg. 10/29 Claire Greenstein’s article with Brandon Tensley “Is Germany’s Future Brown or Green?” published in Slate. 10/14 Claire Greenstein gave a talk on “Political Cover or Moral Imperative: Reparations in West Germany” to the North Carolina German Studies Seminar and Workshop Series. 10/5 Robert Bell’s working paper on “The Challenges of NATO Nuclear Policy” was published by the Finnish Institute of International Affairs. 9/19 Alasdair Young gave a talk on transatlantic trade relations at Princeton University. 7/19 Robert Bell spoke on a panel about the future of US-Russian strategic arms control at Lawrence Livermore National Laboratory. 7/9 Alasdair Young’s paper selected as one of the three best at the EU in International Affairs conference. 5/18 Philip Breedlove spoke about “New Days, New Threats: Adapting Nato’s Strategy” at GLOBSEC in Bratislava. 5/18 Alasdair Young presented to the EU in International Affairs Conference in Brussels. 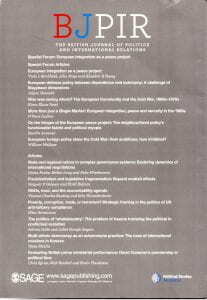 5/14 Special issue of the Cambridge Review of International Affairs on “The Politics of Deep Integration” published on line. 5/13 Georgia Tech’s EU Study Abroad Program began in Metz, France. 5/7 CETS Postdoc Scott Brown appointed as a lecturer (assistant professor) at the University of Dundee. 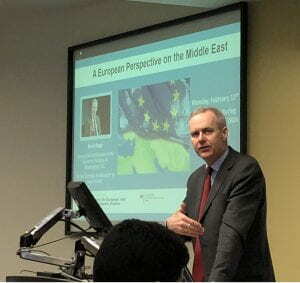 5/3 Alasdair Young spoke at the “Taking Europe Beyond the Ivory Tower” Symposium in Washington, DC. 4/25 Scott Brown’s interview with General Breedlove was published in CABLE. 4/13-14 A major conference on “A Changing EU in an Uncertain World” was held at Georgia Tech. 4/4-7 Scott Brown, Katja Weber and Alasdair Young presented their research at the International Studies Association conference in San Francisco. 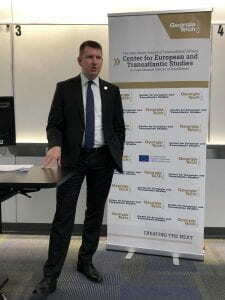 4/2 Quirin Blendl discussed “Cyber Security Challenges Need a Global Approach” in an event co-sponsored with American Council on Germany Atlanta Eric M. Warburg Chapter and Georgia Tech’s CIBER. 3/29-31 Three Georgia Tech students and Vicki Birchfield participated in the European Horizons’ European Student Conference at Yale. 3/21 Gen. Philip Breedlove testified before the House Armed Services Committee. 3/12 Gen. Philip Breedlove spoke to the Henry Jackson Society at the UK Parliament on the West’s relations with Russia. 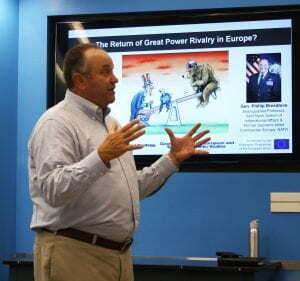 3/7 Scott Brown presented his new research project on the EU’s strategic partnerships with the US and China. 3/5 Gen. Philip Breedlove’s issue brief for the Atlantic Council on Northern European air defense published. 2/20 Antje Ravic Strubel gave a reading of Into the Woods of the Human Heart. 1/31 “The Future of Transatlantic Relations: A Debate” took place at the Academy of Medicine. See press coverage and video. 1/30 Scott Brown’s article “Free Trade, Yes; Ideology, Not So Much: The UK’s Shifting China Policy 2010-16,” was published in the Journal of the British Association for Chinese Studies, Vol. 8 (1). 1/22 CETS hosted a visit by Senator Anna Maria Anders, Secretary of State and Plenipotentiary of the Prime Minister for International Dialogue for Poland. 12/7 The Washington Post’s Monkey Cage published Alasdair Young’s comment on the UK’s need to choose between close trade ties with the US or EU. 12/6 CETS hosted Juliane Schaeuble, head of the Political Department at Der Tagesspiegel. 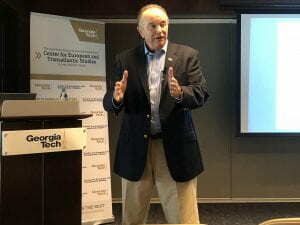 12/1 Georgia Tech faculty met with Richard Price, Chief Economist of the UK’s Department for International Trade. 11/30 Alasdair Young’s book The New Politics of Trade: Lessons from TTIP published by Agenda Publishing. 11/29 Alasdair Young’s article “European Trade Policy in Interesting Times,” published in the Journal of European Integration, 39/7, 909-23. 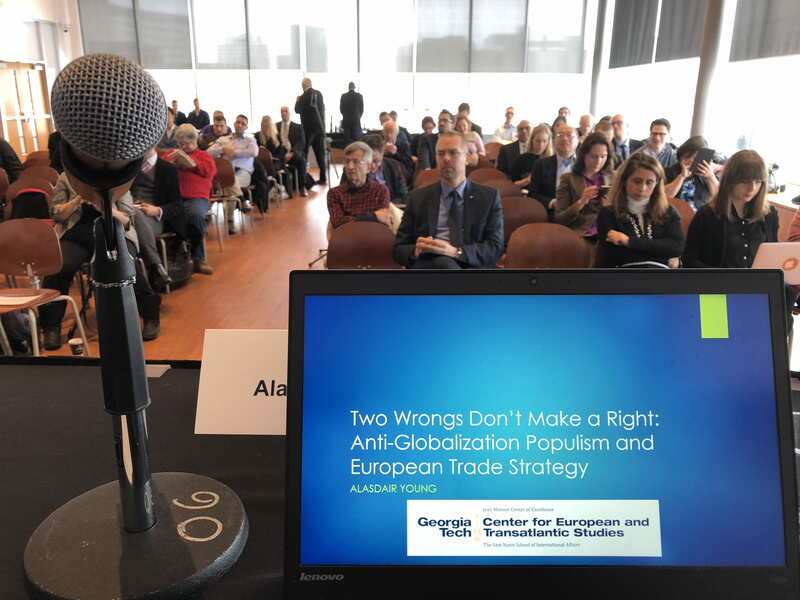 11/28 Alasdair Young presented at the European Commission’s Biennial Jean Monnet Conference: “A Turning Point for Europe” in Brussels, Belgium. 11/28 Nunn School faculty and students met with Samantha Job, the Foreign and Security Policy Counsellor at the British Embassy. 11/27 Scott Brown’s book Power, Perception and Policymaking: US and EU Responses to the Rise of China, published by Routledge. 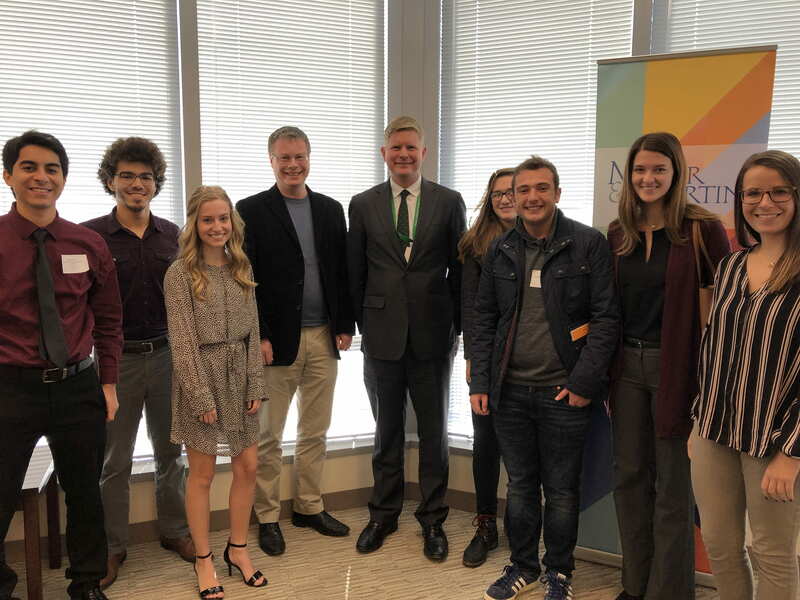 11/20-22 Nunn School students and faculty participated in the Youth Summit on the Transatlantic Digital Economy at the College of Europe in Bruges, Belgium. 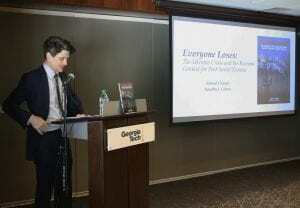 11/14 Richard Stock, Director General of the Robert Schuman European Center spoke on “Vivre ensemble en Europe: hier, aujourd’hui, demain” at Georgia Tech Lorraine. 11/7 Georgia Tech faculty and students attended the luncheon for Irish Ambassador to the US Daniel Mulhall at the World Affairs Council of Atlanta. 11/3 Dr. Alasdair Young participated in a workshop on “What is the Future of International Trade?” at the University of Denver. 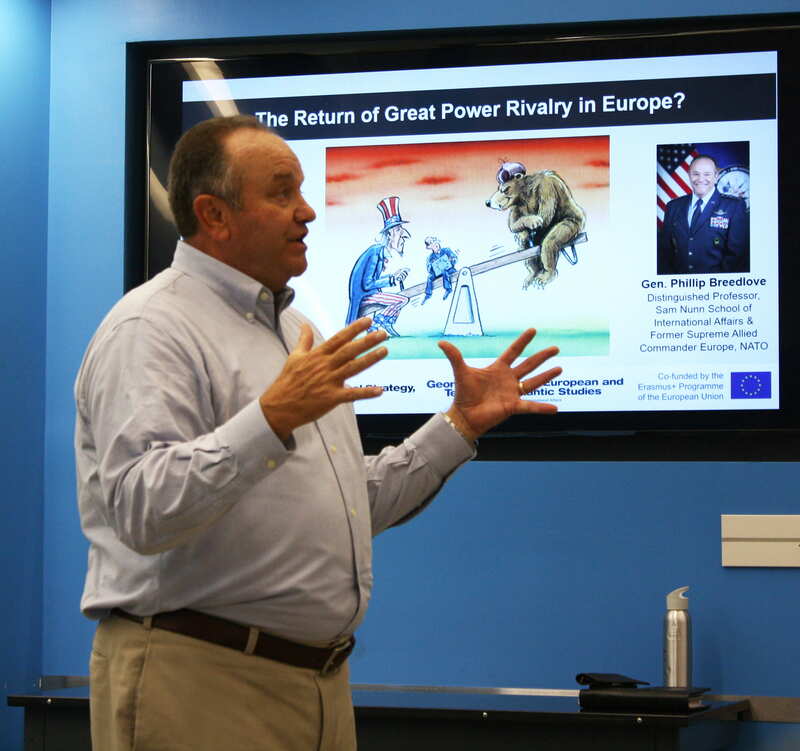 10/26 Dr. Scott Brown and Dr. Alasdair Young discussed the return of great power rivalry in Europe with GT’s European Horizons chapter. 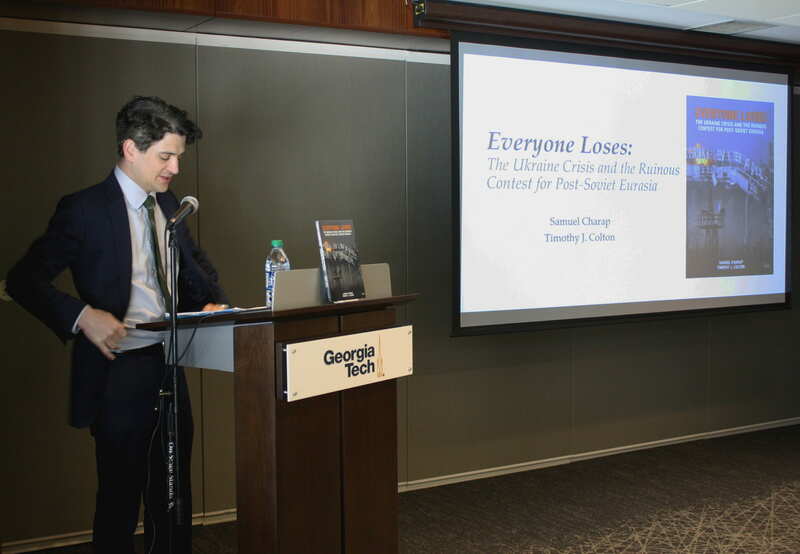 10/25 Dr. Samuel Charap (RAND Corporation) discussed his book Everyone Loses: The Ukraine Crisis and the Ruinous Contest for Post-Soviet Eurasia. 10/20 Gen. Philip Breedlove co-authored “Future War NATO? From Hybrid War to Hyper War via Cyber War” a supporting paper for the GLOBSEC NATO Adaptation Initiative. 9/29 CETS hosted Dr. Vjosa Osmani, member of the Assembly of the Republic of Kosovo. 9/24 The International Affairs Student Organization held a German election watching party. 9/19 Triangular Diplomacy among the European Union, the United States and the Russian Federation: Responses to Crisis in Ukraine was published by Palgrave Macmillan. 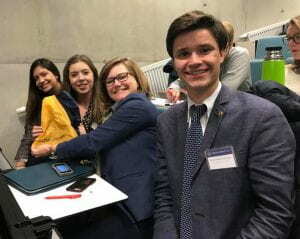 9/13 Georgia Tech faculty and students attended European Commission President Junker’s State of the Union address at the European Parliament. 7/26 CETS was awarded a second Jean Monnet Center of Excellence grant. 7/23 The very successful 2017 EU Study Abroad Program concluded. 7/14 Alasdair Young presented a paper and served as a discussant at the Council of European Studies 24th International Conference of Europeanists, University of Glasgow. 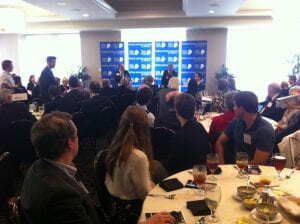 7/11 “The New Face of France” with the World Affairs Council of Atlanta. 7/1 Alasdair Young became a co-editor of JCMS: Journal of Common Market Studies. 6/22-23 Alasdair Young presented a paper on ‘Trade Policy in a Changing EU and an Uncertain World,’ to the ‘Jean Monnet Fellowship Programme @ 25’ Alumni Conference, European University Institute. 6/9 Alasdair Young and Chad Damro’s chapter “National Aims and Adaptation: Lessons from the Market,” published in A. Hadfield, I. Manners and R. Whitman (eds), Foreign Policies of EU Member States: Continuity and Europeanisation, Routledge. 6/5 Scott Brown and Miguel Otero Iglesias’s chapter “The EU and China: Partners in Global Economic Governance Reform?” published in Jing Men and Annika Linck (eds), China and EU: Reform and Governance, Routledge. 6/1 Ben Tonra, Richard Whitman and Alasdair Young (eds), Foreign Policy of the European Union published by Sage. 5/22 Contributions from the “Surveillance, Privacy, and Data Across Borders: Transatlantic Perspectives” Conference posted on the LAWFARE blog. 5/12 2017 Europe Day Luncheon: “All Eyes on Germany”, the World Affairs Council of Atlanta. 5/4-6 Big CETS presence at the European Union Studies Association conference in Miami. 5/3 Alasdair Young participated in a Virtual Briefing on “Transatlantic Relations after the First 100 Days“. 4/26 Scott Brown’s testimony to the House of Commons enquiry on UK-China relations published. 4/18 The “Surveillance, Privacy, and Data Across Borders: Transatlantic Perspectives” Conference took place at Georgia Tech. 4/4 Alasdair Young and Scott Brown discussed “The Future of Europe” with European Horizons. 3/31 The European Union at an Inflection Point: (Dis)integrating or the New Normal? edited by Alasdair Young was published by Routledge. 3/21 Gen. Philip Breedlove testified before the Senate Armed Services Committee on U.S. Policy and Strategy in Europe. 3/13 Gen. Philip Breedlove briefed faculty and students on his recent trips to Europe. 2/21 British Consul General Jeremy Pilmore-Bedford presented the British governments approach to the Brexit negotiations. 2/17 Alasdair Young discussed the demise of TTIP at a workshop at Florida International University. 2/9 Gen. Philip Breedlove testified about US-Russian relations before the U.S. Senate Committee on Foreign Relations. 1/18 Dr. Annegret Groebel of the German Federal Network Agency discussed the insights and lessons learned from Germany’s Energiewende. 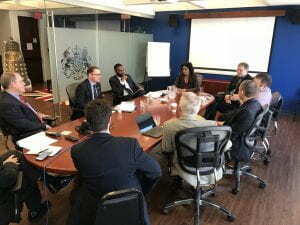 12/8-9 Alasdair Young and Scott Brown represented Georgia Tech at Jean Monnet coordination meeting in Washington, DC. 12/7-9 Vicki Birchfield was an invited participant at the Open Government Partnership Global Summit hosted by the French government in Paris. 11/28 Student Research Cluster on Terrorism and Counter-terrorism in Europe Panel Discussion. 11/28 Gen. Phillip Breedlove, former NATO Supreme Allied Commander Europe and the US European Command Commander, “Euro-Atlantic Challenges: A Way Ahead“. 11/17 Scott Brown’s piece on the implications of a Trump Presidency for Europe and transatlantic relations published by the Scottish Global Forum. 10/10 Alasdair Young was the featured discussant at a workshop on EU trade policy at the University of Southern Denmark. 9/22 New working papers on the Ukraine crisis published. 9/20 Alasdair Young participated in a panel discussion on “Free Trade or Protectionism?” at the University of Pittsburgh. 6/13 Gen. Breedlove publishes article in Foreign Affairs on the challenges facing NATO. 5/26 Alasdair Young moderated a panel discussion on “The Potential Implications of a British Exit from the European Union” with British Consul General Jeremy Pilmore-Bedford; German Consul General Detlev Ruenger and Irish Consul General Shane Stephens at the Atlanta Council on Foreign Relations. 5/9 Vicki Birchfield gave the opening remarks and moderated the Europe Day in Atlanta event “Why Is the Centennial of World War I Relevant for Understanding Europe Today?” at the Alliance Française and the Goethe Zentrum Atlanta. 5/9 Why Is the Centennial of World War I Relevant for Understanding Europe Today? Monique Seefried (World War I Centennial Commission). With the Consulate General of France, Alliance Française and the Goethe Zentrum Atlanta. 4/29-30 Jean Monnet Workshop on “21st Century Trade Politics: TTIP as a Test Case?”. 4/20 Screening of the documentary Dreaming of Denmark and discussion with director Michael Graversen. With the Nunn School; School of Modern Languages; School of Literature, Media and Communication; and Office of the Arts. Ambassador Elin Suleymanov, Ambassador of Azerbaijan to the U.S.
3/21 Vicki Birchfield spoke on La négociation du Partenariat Transatlantique de Commerce et d’Investissement (TTIP): Comment comprendre les oppositions et l’opinion publique des Etats-Unis et de l’Union européenne? et La contestation de l’idéologie du marché: articuler Polanyi et Gramsci, Doctoral workshop organized by University of Paris I, Pantheon Sorbonne. 3/1 Alasdair Young and German Consul General Detlev Ruenger spoke on ‘The European Union: Challenges and Future Prospects,’ World Affairs Council of Atlanta Members Forum. 2/4-5 Alasdair Young presented a paper on “Intergovernmental Policy Makes Transnational Politics? The Distinctive Politics of the TTIP Negotiations,’ paper to the ‘Transnational Relations and the Transatlantic Relationship’ Workshop, Georgetown University. With the Atlanta Council on International Relations. Gérard Araud, Ambassador of France to the U.S.
5/18 Alasdair Young presented ‘The Distinctive Politics of TTIP’ to the Bureau of Intelligence and Research, U.S. Department of State. 4/14 Vicki Birchfield spoke on “Unraveling or Re-Stitching? The EU’s responses to multiple crises from Greece to Ukraine” to the International Club of Atlanta. 3/24 Is Reconciliation Between Ukraine and Russia Possible? 3/17 Alasdair Young spoke on ‘The 21st Century Politics of TTIP,’ University of Dunde (via video link). 1/21-3 Peter Swire spoke on a plenary panel at the Computers, Privacy, and Data Protection ’15 conference. Live streaming of the European Parliament’s hearing on the Commissioner-designate for Trade Cecilia Malmstrom with commentary by Vicki Birchfield and Alasdair Young. 7/2 Vicki Birchfield spoke on “Democracy and Sovereignty in the 21st Century: Lessons from the European Union,” at the Georgia Tech campus in Lorraine (GTL), Metz, France. 6/5 Alasdair Young spoke on ‘Challenges in U.S. Trade Policy,’ North Atlanta Rotary Club. 6/4 Alasdair Young spoke on ‘21st Century U.S. Trade Policy,’ Foreign Policy Association, Great Decisions Discussion Program, Village At Deaton Creek discussion group. 3/8 Vicki Birchfield and co-editor, Giovanna Dell’Orto presented their book Reporting at the Southern Borders at New York University’s Arthur L. Carter Journalism Institute. 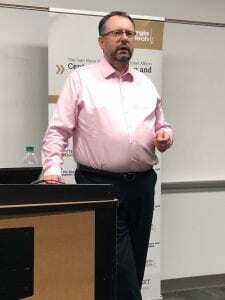 3/6 Alasdair Young spoke on ‘21st Century U.S. Trade Policy,’ Foreign Policy Association, Great Decisions Discussion Program, Dunwoody discussion group. 3/3 Alasdair Young spoke on ‘21st Century U.S. Trade Policy,’ Foreign Policy Association, Great Decisions Discussion Program, Buckhead discussion group. 2/20 Alasdair Young spoke on ‘The Promise and Potential Pitfalls of the Transatlantic Trade and Investment Partnership,’ Atlanta Council on International Relations. 11/7 Alasdair Young spoke on ‘The Promise and Potential Pitfalls of the Transatlantic Trade and Investment Partnership,’ World Affairs Council of Atlanta. 10/25 Alasdair Young participated in a Roundtable on “The transatlantic trade and investment partnership: Impacts on the US Southeast.” France-Atlanta at the Academy of International Business Southeast USA Chapter. Christoph Sander, Consul General of the Federal Republic of Germany. 6/11 Alasdair Young spoke on ‘Transatlantic perspectives on genetically modified food,’ Controversial Topic Discussion Club, Atlanta. 9/27 Roundtable: The Eurozone Crisis: Turning the Corner or a Bend in the Road? 4/2 Vicki Birchfield participated in the “Expert Panel on Transatlantic Relations” at the 29th annual Congress-Bundestag Seminar. 2/15-16 Vicki Birchfield gave the Plenary Keynote speaker at the International Conference on “The World between Crisis and Change” organized by the Karl Polanyi Institute and the Conservatoire national des arts et métiers (CNAM) in Paris, France. 1/22 Vicki Birchfield gave an invited lecture on “From the Elsyee Treaty to ‘Merkozy’: Taking Stock of French-German Relations and the Future of the European Project”on the occasion of the 49th anniversary of the Franco-German Friendship Treaty hosted at the Goethe Institute and Alliance Francaise. 10/11 Vicki Birchfield spoke on “German Leadership and the Crisis in the European Union” to the International Issues Forum at the Villa International (Atlanta).